The first thing you should know about this book and this author is that she's hilarious. If you're tired of boring and dry, this is the antidote. However, if you're like me and consider yourself a serious thinker, you might worry where the opening humor, light hearted self-deprecation and self-helpy prose are leading you. Happily, there's depth and wisdom and maturity bubbling beneath Hatmaker's big personality. 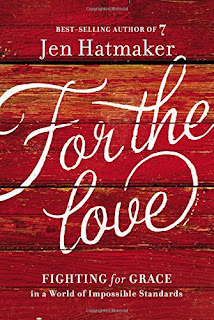 What's striking about pastor and popular blogger Jen Hatmaker's newest book For the Love: Fighting for Grace in a World of Impossible Standards is that she blends personal stories, theology, humor, and practical tips for child rearing, marriage and Christian community so seamlessly. There's even recipes for Roast Lamb and Pad Thai in there. In this way, it's somewhat like a blog. 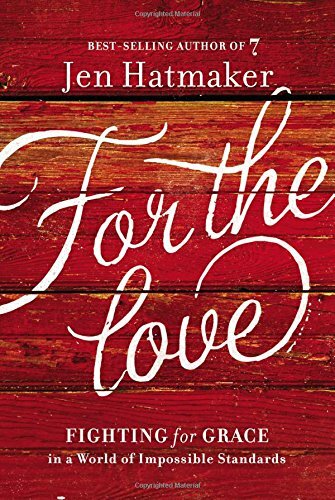 Yet all the parts send a cohesive message, which I think is summed up in these freeing words Hatmaker gives to her five children: "God measures our entire existence by only two things: how we love Him and how we love people. If you get this right, you can get a million other things wrong" (189). Hatmaker's message is grace-filled and points readers toward fighting for grace for ourselves, our families, our friends, church people and "un-church" people. She draws depth from her childhood experience, her years of rethinking church, her mission trips abroad, her family of three biological children and two adopted children, and from her immensely blessed experience of having close, Jesus-minded friends with which to grapple and share and pursue life. Hatmaker also gets away with a chapter entitled "Christians, Stop Being Lame," that proves her a modern day prophetess. She channels Jimmy Fallon with four segments of sarcastic Thank You Notes. (Thank you, Jen Hatmaker, for causing this reserved introvert to draw attention to herself in a quiet airport lobby as she belly laughed at your tirade against airport poop bidets. Sincerely, I'll Just Hold It Until I Get Home) In her conclusion, she compares women to her flock of chickens, and I my inner-feminist wasn't the least bit annoyed. 1. Starting a regular supper club with our closest "couple friends." You know who you are. 2. Doing "Sunday Night Church" in our living room or on our patio or in our kitchen. 3. Raising my children to never fear sharing their struggles and weaknesses with their mom and dad. 4. Chapter 12: Marriage Have Fun and Stuff. 5. Donald and Betsy Miller's philosophy that "their home was sacred, and their ambition was to help restore what the world stole that day to every visitor" (285).